1. Because I love writing them and reading them back. 2. It means it's time for our holiday! This is the reason for the &lsquo;with a difference' title for this report. We decided we wanted to fly direct and go for 12 nights to give me a chance to rest/recover before returning to work. 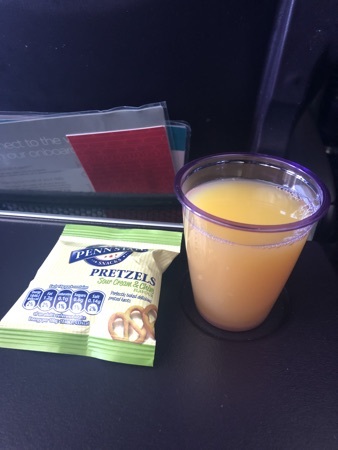 It also means less rides for myself but with that comes more opportunities for snacking while DD and DH do the rides I can't  it gives me the chance to relentlessly stalk MDE for fastpasses (yes I'm sad - I love doing this) and update my trip report. 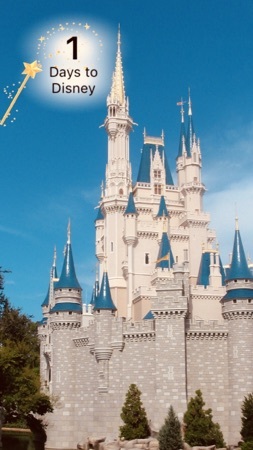 We'll be taking things at a slightly slower pace than usual I imagine, but that's not difficult as we're usually non stop park/pool/shopping/eating kind of people. So pre travel day this time was a bit different to usual. DD was at school in the morning and I had a hair appointment, when I got home around 12 I finished off the last minute packing and after collecting DD from school we set off down the M6. 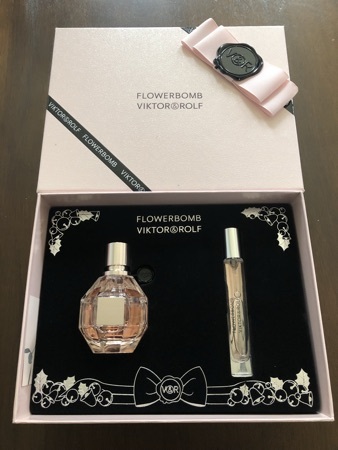 Instead of buying some perfume in duty free, I'd thought ahead and ordered Viktor and Rolf flowerbomb using my boots points, this arrived today, so this is technically my holiday perfume purchase. I decided the mini spray will be ideal to take and the bottle can stay at home! We drove down to a village outside Crewe where we were staying with friends tonight, the M6 wasn't too busy for a Friday afternoon and we arrived about 5 o'clock. This means we're about half an hours drive from Manchester airport in the morning. It's now 4.15am and I'm wide awake and itching to get going! We set off for the airport around 7.30am and arrived at 8am. I rang the meet and greet company when they were half way there to let them know we were almost there and they were there waiting when we arrived. Can't recommend VIP parking enough! Cost us £39 for the 13 days parking and an extra £4 for the exit fee out of the drop off zone. Check in was quite busy but the queue only took about 15 minutes, then up to security where DH set off the alarm and one of our bags got pulled for extra searches. Everyone at security was really friendly. 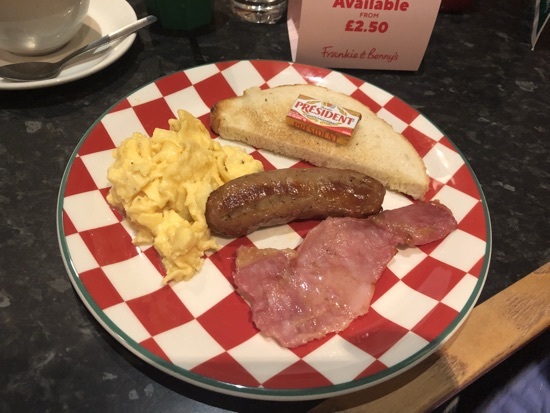 First stop was frankie and bennies for breakfast. There was a small queue for a table but we were seated quickly and our server was over right away to ask about drinks. 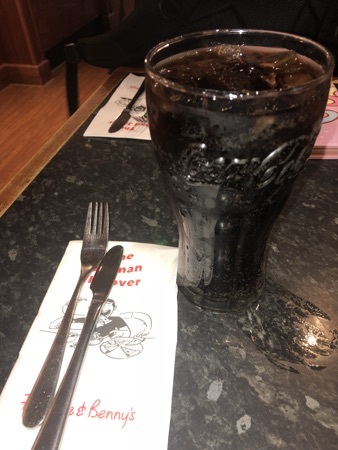 I had a pint of Coke Zero. 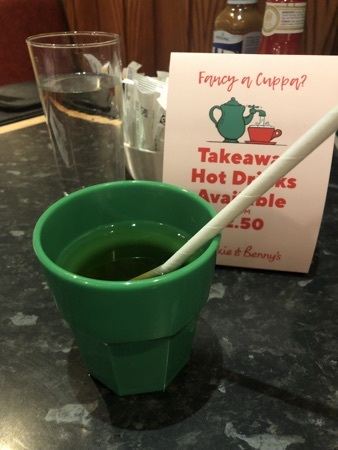 Dd ordered an apple juice which came with the kids breakfast. We all knew what we wanted to eat so service was really prompt. 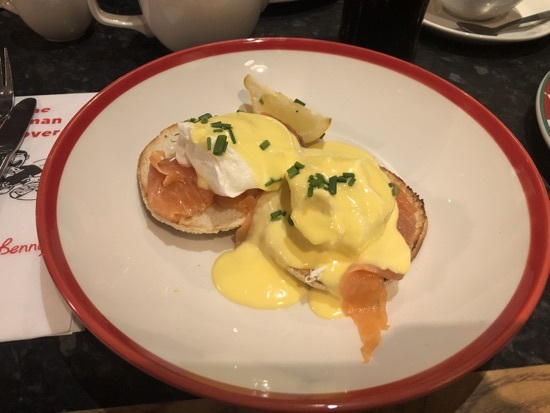 I got the eggs royale which was eggs benedict with smoked salmon. This was really good except the poached eggs were over cooked for my liking, I like runny eggs but I still ate it all. Dd had the kids breakfast where she could pick 4 items from a selection, she chose bacon, scrambled egg, sausage and toast. She ate most of this, i tried the sausage and bacon and they were really tasty. 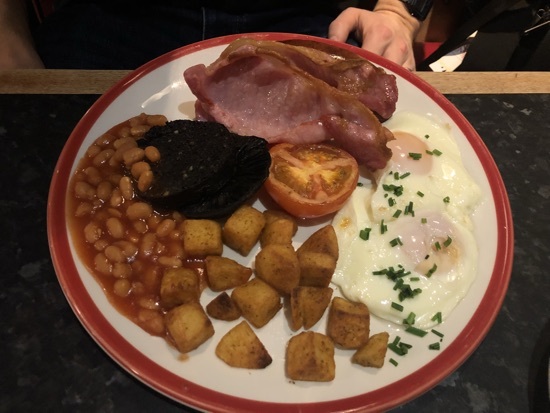 DH had the big one breakfast, he ate every single thing so guessing it was alright  He did mention the black pudding was quite herby and I seem to remember him saying that before in here. We got the bill which came to £32.05, our server was brilliant, really prompt and friendly. We paid up and had a look in a few shops. We realised we'd left our toiletries at home 臘&zwj;♀️ so a quick trip to boots replaced the toothbrushes etc. Our scheduled departure time was 11.35am and we took off at 12pm. The cabin crew cane round with drinks and pretzels about 30 minutes into the flight, DD and I both had fruit juice. 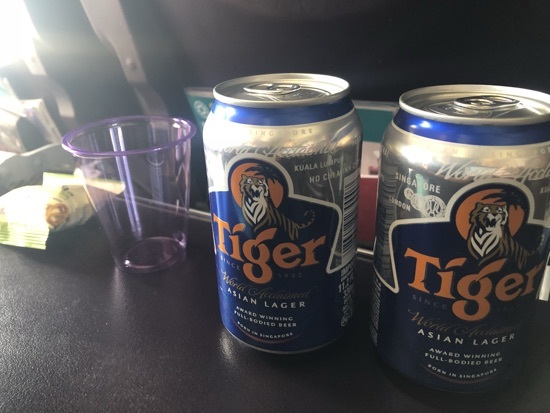 DH took advantage of me being unable to drink and hence able to drive upon arrival and bagged himself a couple of tiger beers! 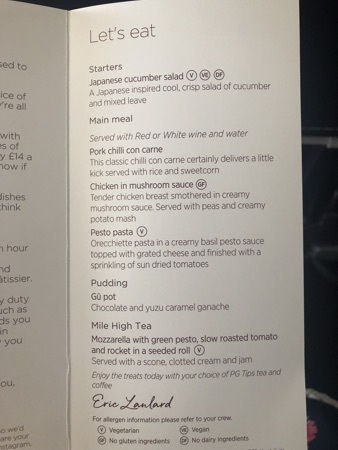 The adult meals were a choice of pork chilli con carne, chicken in mushroom sauce and pesto pasta. I chose the pork chilli, this came with rice and sweet corn, it was ok, I'm not a fan of chilli but didn't like the sound of the other options. 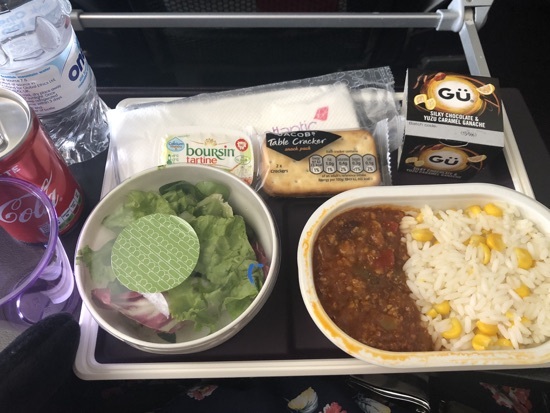 It came with a salad which had a lovely vinegary dressing, crackers & Boursin and a chocolate and yuzu caramel ganache gu pot. The gun pot was really good and really rich but had a kind of orangey taste to it. 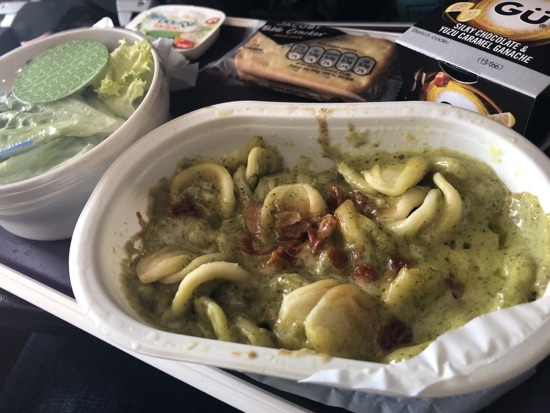 DH had the pesto pasta. 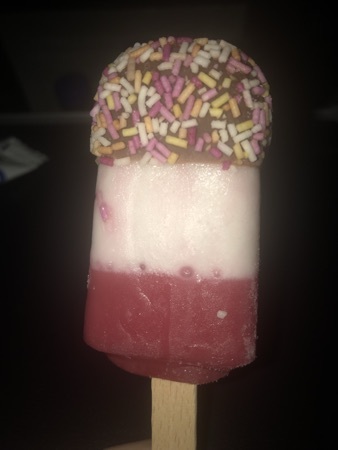 This was ok aswell. 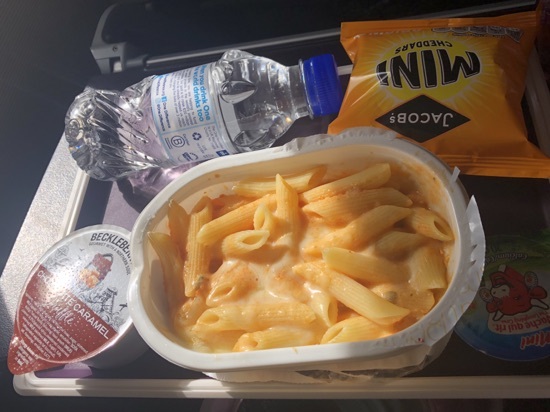 We also had a coke with our meals instead of wine. 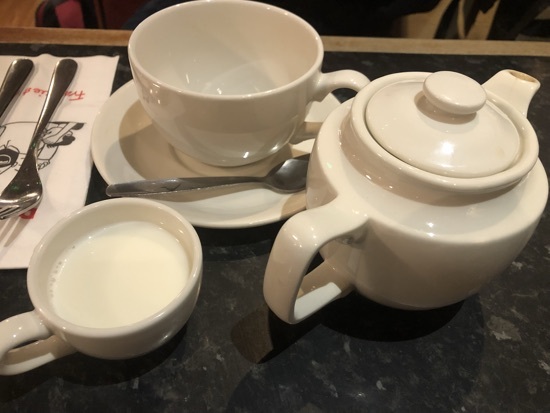 After the food was cleared away and I'd stretched my legs for a few minutes we were offered coffee or tea, DH and I big had tea and it wasn't too bad, they gave us plenty of milk and sugar (not needed) with it which was nice. 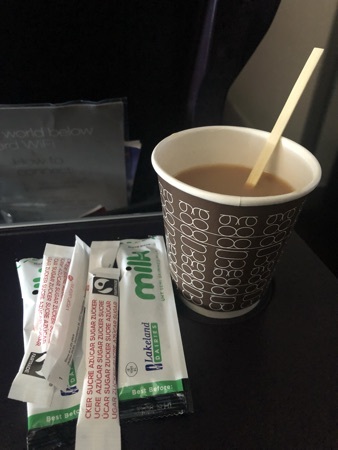 Halfway through the flight the cabin crew came round with mini fab lollies which were tiny but a nice treat. A couple of hours before landing afternoon tea was served. This was a mozzarella and pesto roll which was pretty dry actually and a fruit scone with clotted cream and jam. Once I'd dispensed with the fruit out of the scone it was really good! We landed at 4.35pm Orlando time and we're off the plane quickly, however we arrived into a very busy immigration hall! 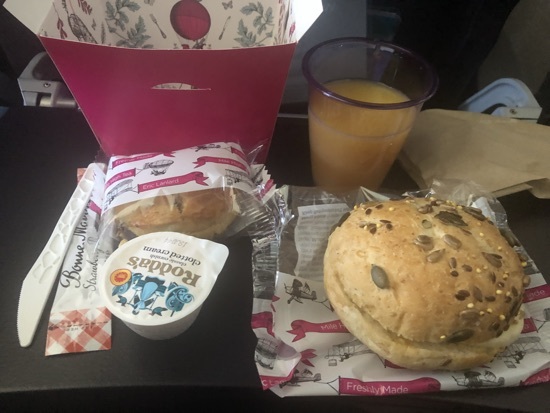 The Glasgow flight had beat us in and the Thomas cook flight. 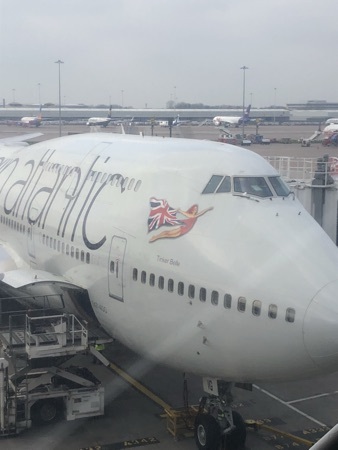 It took about an hour to get seen and through to collect our luggage, it didn't seem that long though as the queue kept moving. Once through our luggage was waiting and we were quickly heading over to the main terminal to collect our hire car. We'd booked a standard SUV and found a nice looking Hyundai in the line so we were loading it up and pulling away in no time. Then we hit the queue for the Alamo exit booth! I have never seen it so busy exiting the car hire garage. Once on the road it was straight to the Boardwalk to check in, we arrived at 7pm and were checked in very promptly. I had requested a high floor and our room is 5005 (5th/top floor) with a stunning view over the boardwalk. As I expected I'm absolutely gutted this is only for 1 night. I have fallen in love with the resort/room/view! A few photos were taken and we were quickly making our way over to our reservation at cape may cafe at the beach club. We'd decided this was a great choice for tonight's dinner as we could eat as much as we fancied and be as quick/take as long as we like. 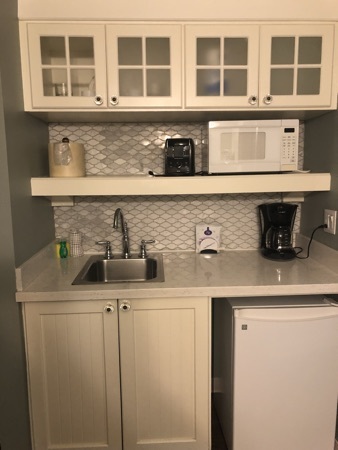 It was a lovely short walk around crescent lake and we've got a convenient staircase not far from our room that comes out on the Hollywood studios walkway. We checked in at 7.45pm and our buzzer went off half an hour later at 8.15pm. 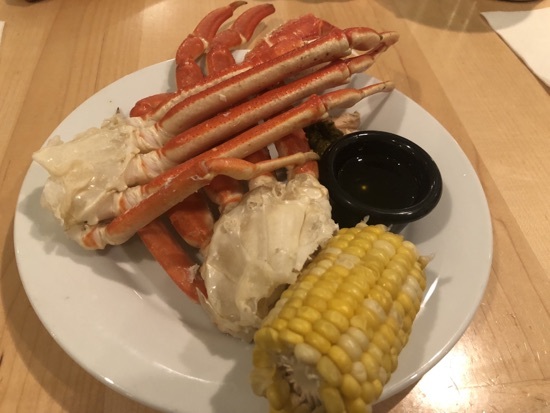 Cape may cafe is a favourite of ours, the unlimited crab legs and desserts are an absolute winner. 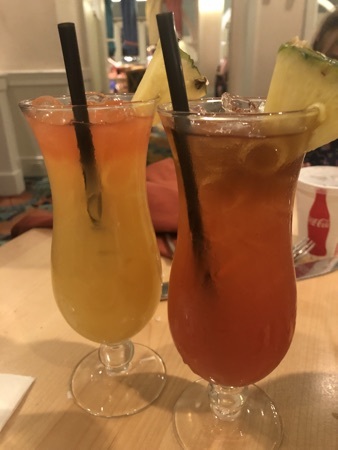 Our server took our drinks order, as the adult dining plan comes with a alcoholic beverage I kindly let DH have mine aswell, so we ordered a captains mai tai, a rum swizzle and a glass of water (for me &#128546 . Dd ordered a coke and our server asked if she would like it made into cherry coke. That was a no brainier as DD has been talking about cherry coke since our last holiday, it's her holiday drink of choice. We made our way upto the buffet and I got a plate of crab legs with some battered clam strips, baked salmon and corn on the cob first of all. The crab legs were cooked amazingly, the meat came out really easily and was so juicy and tasty. I almost didn't bother with the melted butter. 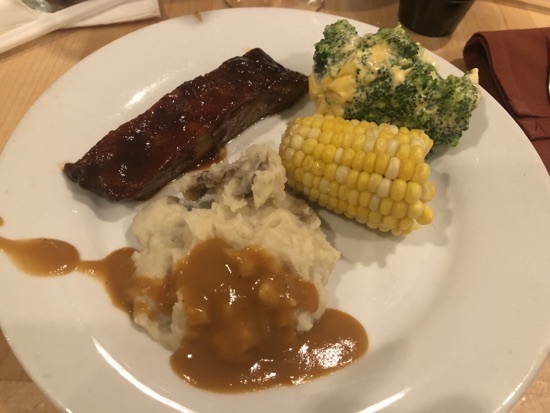 Next plate I tried some of the mashed potatoes with beef gravy, a barbecue rib, some corn and broccoli in cheese sauce, this was lovely and was like a mini meal on itself. 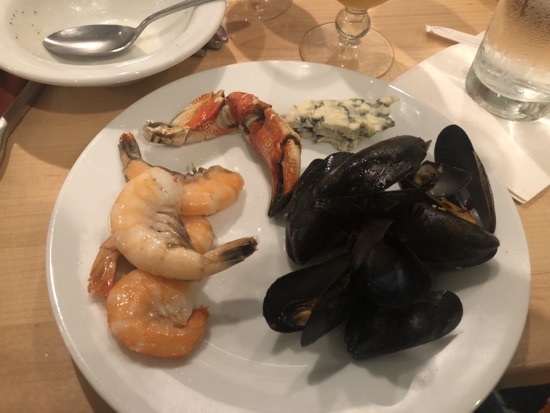 DH grabbed some of the chilled seafood next, shrimp and cold crab, along with some Stilton cheese and mussels. 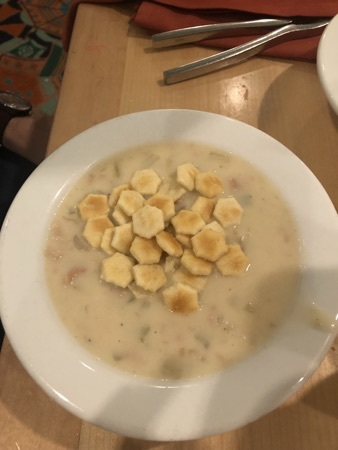 DH then returned having spotted his favourite clam chowder, he absolutely raves about this, so 2 huge bowls were eaten before it was time for desserts. Our server had told us there were 16 desserts available tonight! 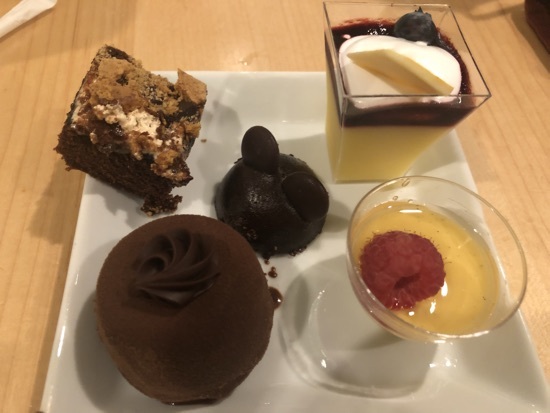 Unfortunately I knew I didn't have room for them all  I selected a Mickey flourless cake, this was really tasty and rich with chocolate button ears. A mini crime brûlée with a strawberry on top, This had a sweet syrup floating on top but was delicious. A brownie topped with chocolate and other tasty stuff, this was quite dry and I left half. An Oreo mousse dome cake, I left the Oreo on the bottom but the Oreo moose and chocolate on top was really good! Finally a lemon curd pot, this was lemon curd topped with fruit coulis and marshmallow fluff, it was really tart but a nice way to finish. There were also a selection of cookies and mini cupcakes and Boston cream pie but we didn't try these. Dd tried a couple of desserts but was more interested in the fruit off the main buffet as was DH. 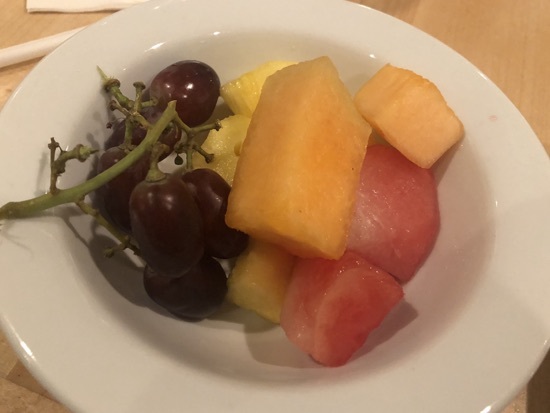 They had some grapes, melon and pineapple. The melon was a bit dry but she enjoyed the fruit. 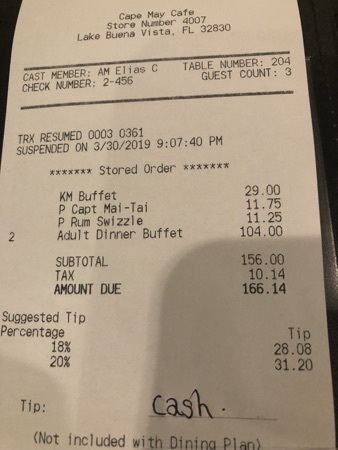 Our server brought the bill over and at this point I was so relieved we had the dining plan, the cost would have been $166 if paying cash, but this was all covered by the dining plan. 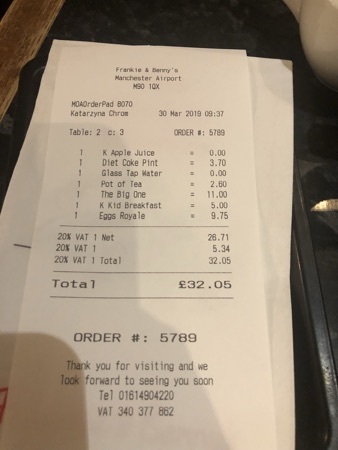 I love cape may cafe but wouldn't dream of paying prices like that to eat here, this is the main reason we do the deluxe dining plan for a night or two during our holidays, it means we can eat at our favourite places at a reasonable cost. We left a tip and wandered back to our room at the boardwalk. The room is lovely and it's a shame it's just for the night but the real highlight is the view! 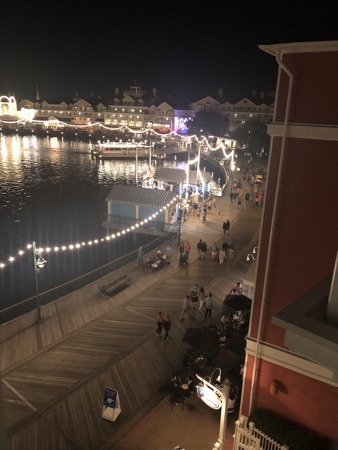 We could see the boardwalk entertainers setting up below us while we sat and had a chill on the balcony before going to bed. Ready for our usual early start in the morning! Have a great time! We went when I was 5 months pregnant with no.1 (and 2 months pregnant with no.2) and I still had an awesome time!